We love the idea that learning a new mantra, meditation, or yoga pose will cause great change in our lives. For me, I thought that if I just put up a pretty website and got busy with business-like things, my life would change. The mantra, meditation, yoga pose, and ‘business-like’ things are all outward actions on the physical shape of the body, vocalization, and so on. The business-like things generated a LOT of literally paper clutter and oodles of electronic slush. We think this seated meditation posture is correct and that sitting meditation posture is incorrect. None are correct and none are incorrect. If anything, our (my) thinking is faulty. It places hope on some external thing: mantra, meditation, pose, procedure. The hardest work is that which we do on ourselves: that work of uncovering the lies we’ve told ourselves or the lies we’ve been led to believe. And they’re not necessarily lies, but rather misinterpretations or “not seeing clearly.” After all, all experience is clouded by previous experience. Let’s say that from a very young age, I was taught that ice cream is evil. So when I see an ice cream truck, ice cream store, or walk near the ice cream store in the grocery I have a tinge of fear. If you see someone eating ice cream, you might fear for their well-being or perhaps their immortal soul. Maybe you’d cross to the other side of the street, turn the other way, all to protect yourself from the very sight of ice cream. I can’t believe anyone would eat that stuff. It’s just horrible. It’s dangerous; ice cream is a killer. It’s terrible for your self esteem. It stunts your growth. It’s not healthy. My parents say ice cream looks like cold mashed potatoes and tastes even worse; there’s no way I’d get anywhere near ice cream. Ewwww, it’s so cold and wet and it smells funny. But maybe you’re the rebellious type and just can’t stop yourself from thinking about ice cream. And – if you didn’t know – what you think about persists and persists…so you think about ice cream a LOT. Perhaps you stand next to someone who just ate ice cream and didn’t suffer or you talk with someone who’s currently eating ice cream and seems to be enjoying the expereince. This curiosity helps you discover a new perspective that you’d never considered. It’s small “enlightenment:” at least one person thinks ice cream is good. You begin to explore ice cream. You read about ice cream. You learn about the ingredients, and about ice cream made. You discover it’s really not cold mashed potatoes. You learn there are a zillion flavors. The process of uncovering the ‘not evilness’ of ice cream takes time. Occasionally it’s an immediate transformation, like a speeding semi-truck to your soul, but more often than not, it’s a slow, steady march of changing consciousness. The thought pattern that “ice cream is evil” is interrupted when you meet someone who thinks ice cream is good. You may not like the opinion, but that one interaction is the thing that puts the crack in your thought. It’s – as Leonard Cohen says – where the light gets in to you that ice cream is (at the very least) not evil. This work of uncovering your closed doors, your dark corners, your locked closets is invisible. It’s not tangible. You can’t touch it or smell it. You can’t show it off to your friends like a cute new dress or pretty picture or new car. But it’s sometimes like a fresh coat of paint in a dingy room, or a slight breeze on a summer day, or a breathy whisper. It’s quiet. It’s personal, excruciatingly personal. 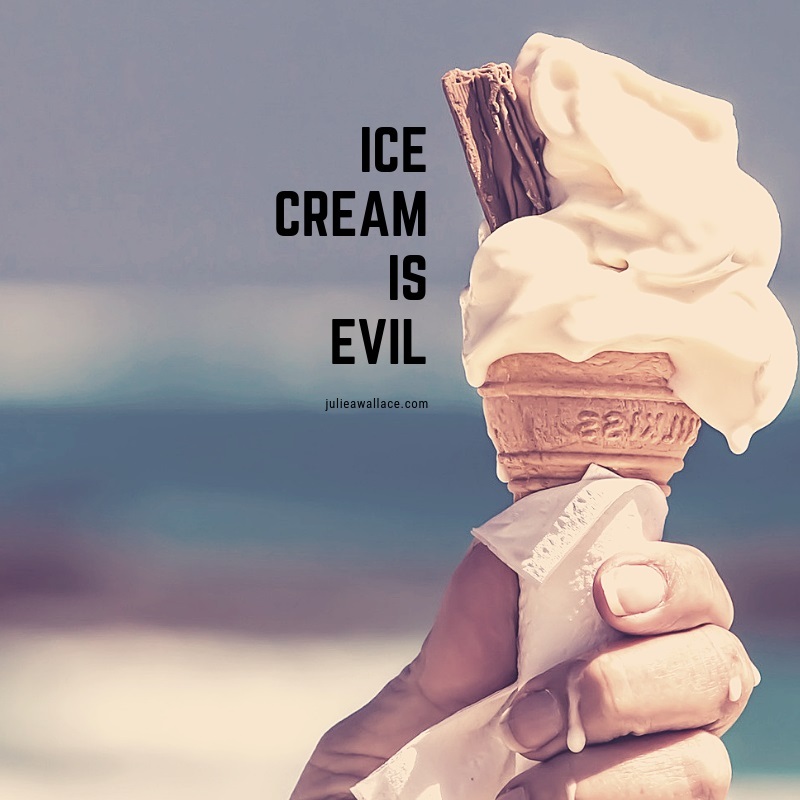 After all, ice cream is evil, right? I don’t know about you, but I love diving in and learning new things: the newness titillates and delights. Even now, thirty years later, there’s still no new tale to tell. The names, faces, gadgets, and disguises have changed, but every little thing you want to explore has been done before. Throw in concepts of alternate and collapsing timelines, multiple dimensions and realities and there’s no doubt this “new” thing has been done thousands of times before. In fact, no matter how much I really want to be, I am not original. Still, hear the peel of the distant bells ringing. Hear the thunder of your heart calling you home. Walk into the class, say hello, begin again to be a beginner. Dance the new dance that speaks you name. Be all you, whoever that may be. I'd love to send you a little something. You're awesome! Thank you for joining the Julie A. Wallace Life Coach mailing list. Copyright © 2019 — Julie A. Wallace • All rights reserved.